Xenia junior defender Maliah Huston outraces a Fairborn player to a loose ball, during the first half of a girls high school soccer match, Oct. 11 at Doug Adams Stadium. Huston later launched a high free kick off a Skyhawks foul that helped setup the match’s first goal by teammate Chloe Castonguay. Skyhawks sophomore midfielder Nevaeh Manning tries to stop a ball that was passed to her, as Xenia junior defender Elizabeth Cline guards her closely, Oct. 11 at Doug Adams Stadium. Host Xenia won the match, 2-0 to claim the Greater Western Ohio Conference South divisional title. Xenia junior forward Alyssia Echols (17) tries to get in front of a pass intended for Fairborn’s Katie Di Flora, in the first half of Thursday’s girls high school soccer match at Xenia’s Doug Adams Stadium. 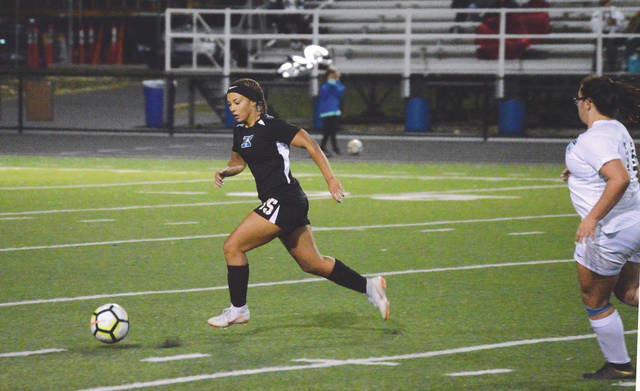 XENIA — In order to win a division title, host Xenia needed to get a win in Thursday’s girls high school soccer match against Greater Western Ohio Conference rival Fairborn. 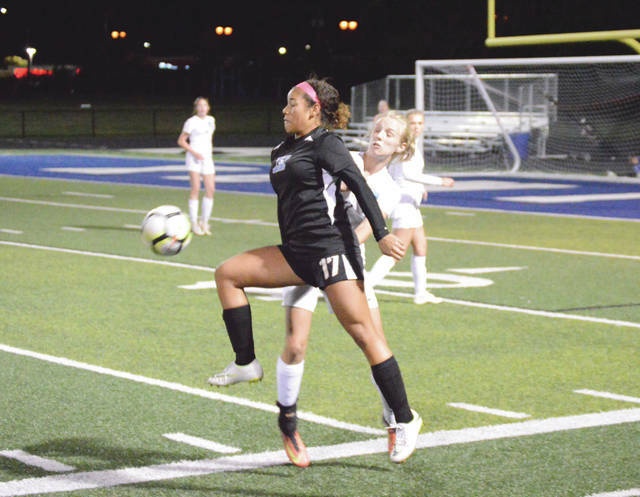 Xenia defeated the Skyhawks 2-0 to claim the school’s third straight GWOC South division title, Oct. 11 at Doug Adams Stadium. The loss stings for Fairborn, who needed either a tie or a win to clinch the title for themselves. The Skyhawks had a golden opportunity to get the first score, barely six minutes into the contest, when sophomore forward Jodee Austin found herself wide open directly in front of the Xenia goal. A Fairborn teammate got the ball to Austin, but her shot sailed high and wide left. Xenia then withstood a Skyhawks corner kick scoring try and soon turned the momentum in the Bucs’ favor. When Chloe Castonguay knocked in a rebound from Maliah Huston’s sky high free kick from about 35 yards out midway through the first half for the go-ahead goal, the Skyhawks were forced to play catchup. Fairborn goalie Cheyenne Kincaid did a nice job of knocking Huston’s moon ball away from the goal, but Castonguay was there to quickly send the rebound into the left corner of the goal from close range. Then in the second half, Xenia co-captain Caiden Butler launched a hard shot at the Fairborn goal from roughly 25 yards out for the other Bucs score. Xenia coach Harold DeLotelle appeared relieved to have his team come away with a third-straight divisional title. “The girls played just good enough to win, but they did a nice job of playing as a team today. That’s something I’ve been working on with them, and they did a nice job of working together as a unit tonight,” he said. Down by a goal at the half, Fairborn coach Keith Rentz opted to go with a more offense-minded lineup the rest of the way. The hope was to put some added pressure on the Bucs, but the strategy may have backfired. 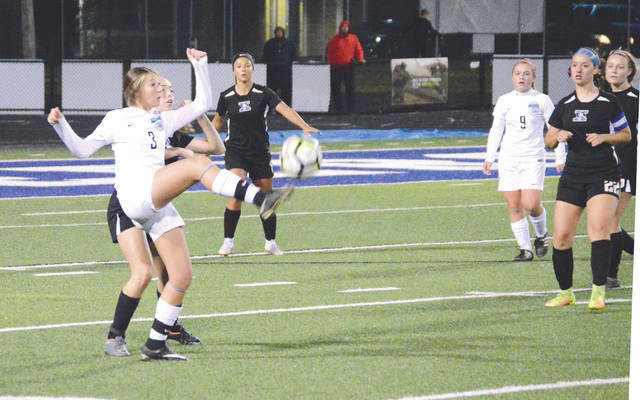 “We knew that a tie could’ve won us the GWOC South, so going up by a goal early, I think, could’ve really changed the dynamics of the game,” Rentz said. Fairborn’s regular season isn’t finished. The Skyhawks head south to take on Middletown for a non-league match at 3 p.m. Saturday, Oct. 13 at Barnitz Stadium. Rentz applauded the play of his seniors, Megan Conners, Hannah Johnson, Isabella Carone, Mikayla Baughman and Kincaid. “Our seniors came out and helped lead this team. They’ve been strong, solid leaders throughout this season and they deserve recognition for that,” he said. Xenia’s eight seniors were recognized during a small pre-game ceremony. Butler, Samantha Steward and Taylor Huffman were the team’s captains this season. Other senior leaders on the Bucs squad were Callie Warner, Kylie Kurtz, Lacey Moreland, Shali Morris and Samantha Price. The Buccaneers have the rest of the week off, but will start practicing for their sectional tournament opener, which will take place at 7 p.m. Tuesday, Oct. 16 up in Clayton against Northmont.